The social network LinkedIn has grown to more than 135 million members and there are now 2.5 million members in the Nordic countries, according to statistics from Socialbakers.com. 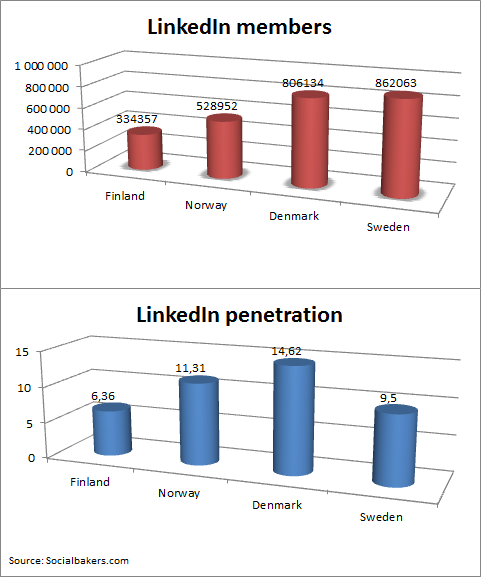 Sweden has the highest number of users, 862,000, but the highest penetration can be found in Denmark (14.62%). With its career focus, LinkedIn is often mentioned as an important social network for job hunting and recruiting. New statistics show, however, that more Americans claim to have gotten their current job through Facebook than through LinkedIn: 18.4 million compared to 10.4 million. Either way, social networks are increasingly playing a vital role in connecting the work force with available jobs. Note: Iceland is not yet included in Socialbakers’ statistics. Impressive. LinkedIn is one of the most important if not the leading professional network in the world. A good way to track the evolution of the LinkedIn and others is a social media monitoring tool. I recommend http://www.socialwatching.com because you have in real-time to view useful graphs about your company or your competitors evolution. Great post as always! I wanted to share the info on Linkedin but can´t find the share button? Have I missed something? Otherwise I can recommend installing it as we see Linkedin driving more and more traffic. Cheers! Thanks, Alex. I used to have a LinkedIn share button but it was rarely used. So I tried some other buttons. Maybe I should bring it back.